Pricing: Two pricing options. You’re billed on usage (how many people attend and how long they’re connected) or you can select an unlimited usage package. No term requirements or monthly minimums. Basic prices: Reservationless audio conferencing, 3.5 cents per minute per line. Operator-assisted audio conferencing, 18 cents per minute per line. Web conferencing: 6 cents per minute per connection — compare with WebEx at 33 cents per minute — or consider the flat-rate option. It supports up to 1,000 participants with no advance reservation required. Pay per use: Yes, see Pricing. An FAQ offers other answers. Bottom line: Infinite is not as cheap as some free alternatives for small teams, but its rates are reasonable and it offers an extensive suite of scalable, secure, feature-rich online meeting capabilities for nonprofits and companies. The site says, “We typically surpass the competition in support and flexibility.” And indeed, there’s live chat support and each account is assigned a dedicated account manager. Nice. 3GoToWebinar offers one of the most reliable and best-known solutions in the marketplace. Just schedule your webinar without tech support, invite people to register, prepare for your event and present your webinar. Streamline your organization’s communications, update employees on new policies, host online seminars and more. Software required: No downloads for participants, supports instant Web conferencing for any Windows or Mac operating system. Invitation tools: Automated email templates, instant or planned webinars and meetings, webinar registration pages. Collaboration tools: Screen sharing via desktop and applications. Multiple presenters, annotating tools, text chat, teleconferencing and VoIP. No mobile access or videoconferencing. Pricing: GoToMeeting for meetings of 15 people or less for $49/month. 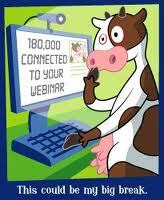 GoToWebinar for $99/month (up to 100 people) to $499/month (1,000 people). GoToTraining, $149 to $349/month. Bottom line: Best for large organizations bringing more than 50 people together at a time. 4Elluminate is marketed as a unifying learning experience for everyone. It supports learning with an easy-to-use platform designed as an inclusive learning environment. Elluminate offers products to fit large institutions as well as smaller customers. Software required: A quick download of a Java file (jnlp) takes about 60 seconds, and then you are launched into your “room.” Supports Web conferencing for any Windows, Mac or Linux operating system. Collaboration tools: Share applications, files, documents, and desktops. Multiple video feeds, up to six. Annotating tools, text chat, teleconferencing, VoIP, videoconferencing. Virtual breakout rooms are available for larger audiences/conferences. Recording: Yes, in Elluminate vOffice and vClass. Elluminate vRoom does not offer an option to record. Post-meeting reports: Yes, you can generate summary and comprehensive usage reports and track who views recordings. Pricing: $499/year for licensing one room with up to 50 users, pricing expands with number of rooms/users. There is also a pricing option for smaller rooms. Elluminate offers several Learning Suite options as well as vSpaces, with meeting rooms for different size audiences. Teleconferencing: 6 cents per minute per user. Pay per use: Only for audio, not video conferencing. Bottom line: Best for organizations that want the flexibility to hold both large webinars and small collaborations with a fixed annual cost. 5Adobe Connect is an enterprise Web conferencing solution for online meetings, elearning and webinars used by leading corporations and government agencies. It’s based on the widely available Adobe Flash technology. Released in November 2010, Adobe Connect 8 software has a new simplified interface featuring better organized controls, accessibility functions and one-click sharing. Software required: No downloads, supports instant Web conferencing for any Windows, Mac, or Linux operating system. Invitation tools: Online calendar and meeting scheduler, compatible with Microsoft Office. Collaboration tools: Screen sharing via desktop and applications. Multiple presenters, annotating tools, text chat, teleconferencing, VoIP, videoconferencing. Pricing: Adobe’s buying guide offers different purchase options for individuals and small businesses vs. companies, government agencies and educational institutions but doesn’t clearly define the cost of Adobe Connect for nonprofits. Adobe Connect Pro: $55 per host per month (training, events, and webcasts additional) or $45 per month under annual plan. Pay per use: 32 cents per minute per user. Bottom line: A good choice for professional use. 6TechSoup Global, the technology resource for nonprofits, has been using ReadyTalk for the past few years for all its Web conferencing needs. Software required: No downloads, supports instant Web conferencing for any Windows, Mac or Linux operating system. Invitation tools: You can use your own CRM (customer relationship management) system, customize registration information. Post-meeting reports: Detailed registration, campaign tracking and survey info. Pricing: Many pricing options: Individual program $49/month (up to 15 people) to $99/month depending on number of subscriptions; yearly and more detailed plans available. Corporate plan for up to 1,000 participants. Pay per use: 10 to 20 cents per minute per participant depending on services. Trial: 30 days (can choose either single-user or corporate multi-user). Bottom line: ReadyTalk has a few quirks — international conference calls are a pain — but on the whole you’ll likely find something suitable for your organization in one of their pricing plans. 7Pleasanton, Calif.-based Zoho offers a suite of cloud-based tools that rival Google Docs in many ways. Its Zoho Meeting provides remote support, online meeting and Web conferencing features to host instant meetings or Web meetings for your audience. You can embed Zoho Meeting in your blog, wiki, notebook or any webpage for a mass Web conferencing. Software required: No downloads. Will run through Firefox and Internet Explorer with plug-ins. Invitation tools: Invitations from the Zoho Meeting Web page or conference in from the presenter. Collaboration tools: Screen sharing via desktop. Multiple presenters, text chat, teleconferencing, VoIP. No annotating tools, mobile access, videoconferencing. Pricing: $12/month per host (up to 5 participants) through $49/month per host (up to 100 participants). Trial: Free Edition – one host and one participant and 30-day free trial. Bottom line: Great choice for small to mid-size nonprofits or if you’re just trying out hosting a webinar for the first time. 8The granddaddy of Web conferencing services, WebEx, was purchased by Cisco in 2007 for $3.2 billion. The WebEx suite offers a broad range of Web conferencing services, including a Meeting Center, Event Center, Training Center and Support Center. WebEx and Microsoft Office Live Meeting are considered the two heavyweights in the field. Software required: No downloads for participants, will run on any Internet server or smartphone mobile device. Invitation tools: Send meeting invitations and reminders using an automated phone call, text message, email from your local client or instant message. Collaboration tools: Screen sharing via desktop and applications. Multiple presenters, annotating tools, text chat, teleconferencing, VoIP, mobile access for iPhone and Blackberry devices, videoconferencing. Pricing: $49/month or $468/year per host. Additional options for the WebEx Training Center (up to 1,000 participants) and Event Center (up to 3,000). Pay per use: 33 cents per minute per participant. Trial: 14 days, up to 25 people per meeting. Bottom line: Best for conservative organizations that want to depend on reliable stand-bys. A number of webinar providers, like Awareness, use WebEx to power their webinars. 9Microsoft Office Live Meeting lets you hold a virtual meeting with small or large groups of participants. Live Meeting allows users to exchange information via live video and audio interaction, chat, shared files or desktops and pre-recorded presentations. Presenters can receive real-time feedback from meeting attendees to allow them to adjust their pace and content. We like the presentation and annotation tools for underscoring major topics and whiteboarding ideas. Invitation tools: Linked into Microsoft Outlook as an add-In, providing a Meet Now button to create ad hoc meetings. Other ways to invite participants as well, such as IM. Collaboration tools: Screen sharing via desktop and applications. Multiple presenters, annotating tools, text chat, teleconferencing, VoIP, videoconferencing. No mobile access. Pricing: Standard Edition users, up to 250 participants per meeting at $4.50/month per user. Professional Edition users, up to 1,250 participants per meeting at $16/month per user. Pay per use: Yes, available only through specific partners. Bottom line: Live Meeting offers steady performance with a 99.99 percent uptime availability and a rich feature set that make it a solid choice for behind the firewall. Integration with other Microsoft Office products. High-quality video performance. Prices quickly escalate, though, with more participants or large-scale events and meetings. 10AT&T Connect offers an intuitive, easy-to-use interface for audio, Web and video conferencing. The product allows you to communicate and collaborate on documents and share applications in real time from your desktop, laptop or mobile device. Its Call Me feature makes it easier for participants to join the audio bridge. Software required: Both a Participant Application (to download) and a Web-based participant option are available. To host a session, the user must download the Participant Application (not available for Apple or Linux OS). Mobile applications for Blackberry and Apple OS also available. Invitation tools: Microsoft Outlook and Office Communicator plug-ins. Collaboration tools: Screen sharing via desktop and applications. Multiple presenters, up to four. Whiteboard tools, text chat, teleconferencing, VoIP, mobile access, videoconferencing. Recording: Records sessions in proprietary format. Can only be viewed within the Participant Application. Post-meeting reports: Yes, you can track attendees, time attended, and views of recordings. Pricing: Audio: 8.5 cents per minute per participant. Web conferencing: 12 cents per minute per participant. Flat monthly pricing for Web conferencing available, but varies. Bottom line: Best for large businesses that require a scalable solution. Note that Mac users can’t host conferences but can join through the Web-based version. 11Yuuguu enables users to securely share their screen with anyone at any time on a PC, Mac or Linux machine. Its personal networking tool lets you see when colleagues or friends are online. Invitation tools: Instant Meetings or Automatic Email Templates. Collaboration tools: Screen sharing via desktop, applications. Multiple presenters, annotating tools, text chat, teleconferencing, VoIP, mobile access. No videoconferencing. Pricing: Free for up to 5 participants. Single user $15/month, unlimited use with 30 participants, packages for larger groups. Trial: Entry level is free – up to 5 participants. Bottom line: Yuuguu is a flexible, simple, low-cost offering in the online collaboration market. 12The basic version of Yugma allows you to invite up to 20 participants into an online meeting. Yugma Pro offers real-time collaboration with white board & annotation tools, recording of webcasts and more. Collaboration tools: Screen sharing via desktop, shared file space, single application sharing. Multiple presenters, annotating tools, text chat, teleconferencing, VoIP, mobile access. Videoconferencing with Skype edition. Post-meeting reports: Registrant and attendee information available. Pricing: Yugma Free, up to 20 attendees, is free. Skype Edition available. Yugma Pro 20/50/100/500 (20-500 participants) costs $9.95 to $159.95/month. Yearly plans available. Optional webinar at $19.95/month. Bottom line: Don’t need the frills? Here’s a good, low-cost option for organizations with basic needs. 13IBM Lotus Live, IBM’s new online collaboration solutions delivered as a service, is a full-featured, easy-to-use service for holding Web meetings and online events. Hosts can show any document on their computers to an audience such as a PowerPoint presentation. File sharing, email, group collaboration and integration with Salesforce applications are also supported in a single platform. Invitation tools: Instant or planned meetings. Link to registration page, email sent through IBM or instant meeting. Collaboration tools: Screen sharing via desktop and applications. Multiple presenters, up to four. Annotating tools, text chat, teleconferencing, VoIP, mobile access, videoconferencing. Pricing: Lotus Live Meetings, $39/month for 15 participants, $59/month for 200 participants. Lotus Live Events, $79/month for 1,000 participants and other options. Bottom line: Lotus Live services offer users new ways to work more effectively with people inside and outside their company, including customers, partners and suppliers, at a predictable monthly rate.You may wind up with Lotus Live after sampling some other Web conferencing software. 14HearMe, a division of Paltalk, is an online meeting service that lets companies or individuals conduct online business meetings with employees, clients and contacts via a plug-in for your Windows-based browser. Multicasting support for large number of participants. Educators use HearMe’s Web meeting services to teach students around the globe. Software required: No downloads, supports instant Web conferencing for Internet Explorer and any browser that fully supports ActiveX controls. Mac and Linux users cannot use HearMe. Invitation tools: Basic invitation tools. Collaboration tools: Screen sharing via desktop and applications, not just documents. Teleconferencing, videoconferencing, text chat, file sharing, H.264 video technology, VoIP, mobile access. Pricing: Basic plans: $29/month for 5 participants; $49/month for 10 people; $99/month for 25 people; $149/month for 50 people. Additional plans and annual pricing available. Unlimited use of voice & video conferencing with no incremental teleconferencing costs. 15DimDim is one of our favorite Web conferencing services: cheap, no-nonsense and to the point. Invitation tools: Instant or planned meetings with smart urls. Invitations from Dimdim, local email addresses or smart url can be used as a simple log-in. Pricing: Dimdim Free (up to 10 participants), Dimdim Pro $25/month (up to 50 participants), Dimdim Webinar $65/month (up to 50 person meetings and 1,000 attendee events). Dimdim Business $696/user/year (up to 100 person meetings). Annual discounts. Discounts for other client referrals. Trial: 30-day free trial for Pro, Webinar & Business. Bottom line: Best for quick collaboration among small teams. Update: Salesforce announced on Jan. 6, 2011, that it is buying Dimdim for $31 million to bring real-time messaging and collaboration tools to its Facebook-style enterprise collaboration service Chatter. Dimdim is no longer accepting new accounts. One reader suggests adding FuzeMeeting to the list because of its support for mobile conferencing. • In February 2011 SlideShare introduced ZipCasts, which enable live video presentations and some conferencing features. • Promising newcomer: MeetingBurner, opening in early March, looks like a great new addition in the marketplace. Join a meeting in 5 seconds. Meetings takes place in the Amazon cloud. Have your own favorites? Please add them below! Original articles at TechSoup: Web Conferencing Tools: Right for You? and Web Conferencing Software Comparison Chart. These articles — and this updated version — are published under a Creative Commons Attribution NonCommercial No Derivatives license. Just finding your site! Very helpful information! Check out http://www.meetingl.com it doesnt require installation and its free! This looks good — do you have any updates for 2012 you’d like to add to the list? Thanks for putting this together! As a promising newcomer you can surely add http://www.uberconference.com/ . It provides free conference call services with a great visual interface. I am looking for a web conferencing software that enables the participants to be sent into virtual break-out rooms where they can collaborate on individual projects (and share docs, chat, video, markup, etc in these break-out rooms). Several vendors provide this feature. However, I would like these rooms to stay active and accessible to the participants even when the meeting or conference ends and the host is not online. This feature does not seem to be supported by the vendors I have checked (e.g. Adobe Connect). This scenario would be used for a multi-lecture distance-based course, where breakout groups would work on individual projects after the class presentation has ended. The participants can return to the virtual breakout rooms at their convenience with the project materials remaining active in the room. The meeting host can also enter the room to share course materials and ideas, and the virtual breakout room participants can also link back to the main meeting. SUGGESTIONS? Yes, I recommend you look into http://www.startmeeting.com. Participants can join your Online Meeting via IPad. 30-Day Free Trial. Enter Promo Code: BROOGRDRS4 for 14.95/month access. 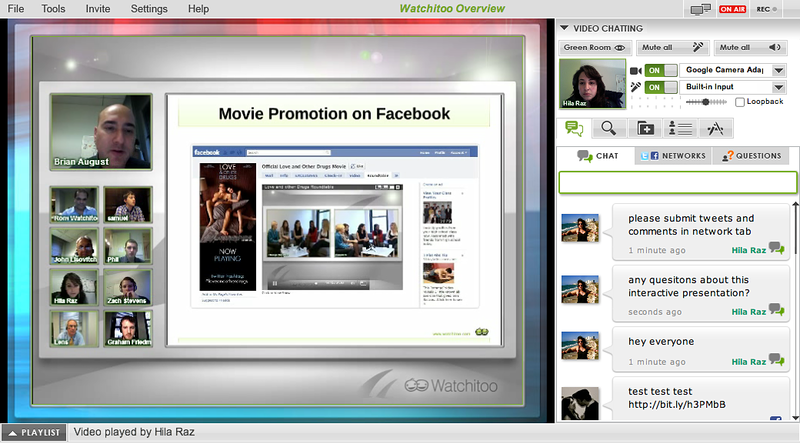 @VSee ( vsee.com ) is a simple video conference and screen share tool. It’s great if you don’t have a lot of bandwidth to spare and can work over 3G cell networks and in places with poor infrastructure such as Africa and the Middle East. It’s a superior, download-free platform and significantly less expensive that the rest. OK. That was a different review. Half of the recommendations for virtual webcast software I have never heard of before. I did appreciate your round up. Although none of the web conferencing software seemed expensive I am on a beta for a system called VirCast http://VirCast.com and they have cracked the pricing to just about nothing… 300 seat rooms for under $15 and the duplex audio with zero latency is spot on. 10 hd camera collaboration at a time. Anyway, it may be of good interest to take a look. http://www.bell.ca/shop/Sb_viewProduct.page?sku=SB_PHO_CON it supports large groups too. We offer a 50% discount to not for profit services like universities, government organizations, and other not for profits. We’ve also recently launched a completely revamped web and video conferencing service. I use ScreenConnect in conjuction with Skype or phone conferencing. Nice because there are not subscriptions associated. Great list of tools. Another option is deploying on premise RHUB web conferencing appliances in order to conduct webinars, web conferences, online meetings, web casts etc. I am an avid TeamViewer user myself. I use it for my clients for my business My Computer Doctor – http://www.mycomputerdoctor.net – I love the fact that even with slow internet connections such as DSL I can still do my job with ease. Thanks for the article! Great post. I am using Skype for online lessons, but for more people one of the above solutions should be considered. We prefer http://www.venuegen.com and their 3D Web environment to maximize meeting immersion. Meetings can be public or private. These are great tools for me to be able to stream my Greek lessons to more than one students . Why not try Drum Web Meetings? (http://thisisdrum.com/). They are free and utilise the revolutionary technology that is WebRTC to communicate in browser with no downloads! We have been using it for sometime now on a regular basis. Additionally, you may even try using a RHUB web conferencing server http://www.rhubcom.com for all your online meeting needs. Whenever students visit college or university campuses many people are encouraged to be a student from that particular university. The actual excursion guides’ show all of the facilities in addition to accolades that are offered to get you enrollment… also to gain the educational costs monies. I’d like to add one more service review in your style. Software required: No set up, Windows, Mac or Linux supported. Bottom line: Myownconference is a good choice for small business owners as well as for speakers who present to large audience.